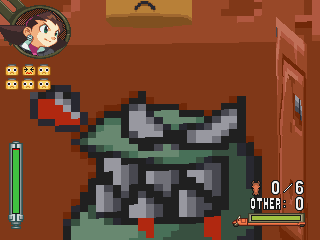 Rockman Corner: Hidden Image In "Tron Bonne"
Hidden Image In "Tron Bonne"
Dan discovered this strange image in The Misadventures of Tron Bonne the other day; a monstrous face hidden within the Servbot farm truck (Sart Farm mission). I love little nuggets like this. I didn't know they hid textures inside things. I wonder why they drew that little ditty in there. Kinda looks to me like something from Yoshi's Island or perhaps Blob from Clay Fighter, lol. It reminds me of an eviler version of the lava monster from Yoshi's Island. Actually a Japanese person has had a video on YouTube for a couple months that shows this very same thing. it also shows a few bugs that are quite interesting. HE LOOKS RAD, EAT PROTEIN!